We buy and register email accounts for your account! 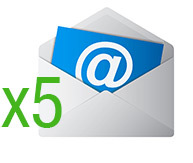 Pack of 5 email accounts (example www.mycompany.com). We buy and register the accounts you will use up to a maximum of 5. The purchase of emails is bound to the possession of the domain at our Reference Provider. For all other extensions the price will be provided on request.